Okay, so maybe it wasn't QUITE as magical an evening for me as it was for the nameless lead singer of the Four Season's smash 1976 number-one hit, " December, 1963 (Oh, What A Night)"--hey, it WASN'T Frankie Valli's ever-reliable falsetto up front, as he was atypically relegated to mere back-up duties in that sole instance, most likely because no one really wanted to hear how he lost HIS virginity!! But in a very real sense, an extremely peculiar little story called "The Night Of March 31st" (first appearing in the May, 1961 issue of SUPERMAN comics, #145) may well've had as life-changing an effect on me as that eye-opening encounter undoubtedly had on our reminiscing crooner. One can only hope that our then-unSeasoned youth didn't have to eventually categorize any of his actions that memorable evening using terminology borrowed from that now-infamous feature's ALTERNATE title: "The Great Boo-Boo Contest"!! True, it was the whole Bizarro phenomenon that had had me wavering, but it was this specific story that pushed me over the edge, finally motivating me to go down to Heisenbuttel's General Store and search for a copy of SUPERMAN #145 of my own to buy. Well, as fate would have it, my search was in vain, as that particular issue was sold out. Instead, SUPERMAN #146--featuring, serendipitously, "The Story Of Superman's Life" as its cover feature--beckoned me to sacrifice one thin, silver dime to sample its four-color delights, and well, after THAT, there was no going back. 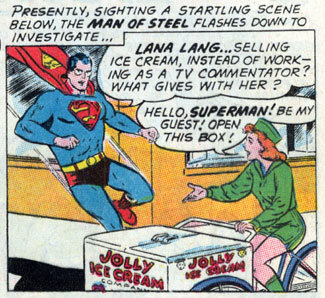 But making that all-important first regular purchase, and all the ones that have since followed, may've never even occurred if Superman hadn't forgotten to doff his Clark Kent glasses whilst erstwhile childhood sweetie, Lana Lang, attempted to kill her old boy friend by pulling a big ol' Kryptonite boulder out of the "Jolly Ice Cream" (or was it "Golly Ice Cream"?...) push-cart she was peddling down the streets of Metropolis one fine day. Editor Mort Weisinger, already notorious for filling his line of books with stories that were--in the context of the accepted continuity, please understand--dreams, hoaxes, and imaginary, played a completely NEW angle with this 8 pager--it was nothing more and nothing less than a PUZZLE!?! You know, like the sort that used to turn up in magazines aimed at young children, the ones that would purposely ladle as many egregious errors as possible onto (generally) a single full page illustration, some of which would be blatantly obvious, while others would be deceptively subtle? Well, having long had a firm grasp on the (seeming) immaturity of his target audience, that's what Wiley Weisinger did with this particular exercise, only he expanded it from a mere single drawing out to an entire story, one filled not only with inconsistent artistic continuity mistakes, but with highly suspect illogical story twists--and given some of the whoppers Mort had his scribes serve up in their REGULAR tales, brother, that's going some!! Which leads me to address a side issue--for years now, I've mocked the work of Mort Weisinger, and there are some pretty darn good reasons for the playful contempt I've shown his early sixties output: given the inherent majesty of the protagonists, the material is often overly concerned with extremely trivial matters; the way the characters treat one another is often blithely inconsiderate at best and calculatedly mean-spirited at worst; and the most startlingly inane succession of unlikely events routinely occur simply to push the plot de jour along towards its crazily contrived conclusion--and that's all in a GOOD issue!?!. A really choice 8-page "Lois Lane" escapade, for instance, could be aggressively silly, mind-numbingly stupid, AND gratuitously sexist all in a few short pages!! Its one of the many reasons these stories remain such a delightful guilty pleasure to read even today. 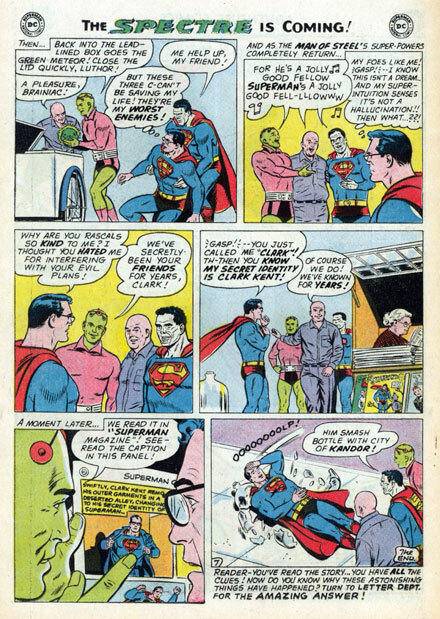 With six titles to continually pump full of new material, Weisinger began introducing elements in the late fifties that could efficiently be employed in any one of his half-dozen books at any given time: several exotic forms of Kryptonite to join the standard green variety; a cadre of Super Pets; various belatedly discovered survivors from our star's home world, including a cute young blonde haired cousin; an entire Kryptonian city trapped in a bottle; a realm where criminals from the now-destroyed planet existed in phantom form; an almost mystical double "L" fetish; a secret fortress off in the arctic wastes; an entire planet populated with wacky doppelgangers of the core cast; and a group of super-heroes from the future who were as likely as not to turn up at the penultimate moment of just about any story in any book to help wiggle the featured character(s) out of an all too seemingly impossible situation! Compared to the Superman stories of the mid-fifties, wherein the Man of Steel was mostly over-matching the likes of small-time pistol packin' bank robbers on a monotonously regular basis, the far more imaginatively expansive and cohesive universe that Mort had manufactured for the Big Red S by the time 1961 rolled around, flaws notwithstanding, is hard not to be seen as the far more entertaining approach. Despite being given these props, it's not difficult to understand just why Stan Lee's slightly later attempt was given all the respect Weisinger's earlier foray was not. For one thing, as mentioned previously, he employed many of these otherwise truly creative concepts in service of regrettably pedestrian--even petty--plots. Was the notion of a group of teen-aged super-heroes from the 30th century BEST employed by having them whisk back through the centuries in their handy-dandy Time Bubble merely to prevent Lois from walking in on Clark, skulking around the broom closet as he's changing from his dark blue suit into his light blue suit? Stan and Jack never wasted THEIR readers time with such piffle, that much I do know. The other major drawback Mort suffered in comparison to the upstart Marvel Universe was pretty much out of his hands: while the small group of books handled by Lee, Kirby, Ditko, et al, proved to be of a size that was just manageable enough to present a convincing illusion of cohesiveness, the Superman Family of books was but a small portion of the much larger overall DC Comics line. Certainly, they were DC's flag-ship titles, but outside of a tenuous alliance with the Batman titles, and a necessary association with Julie Schwartz's Justice League series, like Las Vegas, what happened in the Superman books, STAYED in the Superman books! Ah yes, the focal point of this piece! Pardon me for drifting off on a peripheral tangent. I just felt crystallizing my thoughts on the oft-times controversial editorial reign of Weisinger might be a wise way to go, since it could help those unfamiliar with either Mort or this oddity to better understand both. I can still vividly recall how, that at that strangely life-altering moment, as the rest of the kids loudly attempted to point out all the blatant boo-boos to be found on the cheap pulp paper, I instead stood silently transfixed, gazing at the muddled images in front of me with an unique combination of awe, curiosity, and queasiness. The first two reactions are fairly self-explanatory, but the latter one demands some further explanation. How best to describe my feelings? Well, for starters, the whole thing seemed vaguely unsettling. I'd only ever read a handful of Chucky's Superman family comics up to that point, but I'd invested enough time with these iconic characters to realize they were all behaving just plain WRONG!! 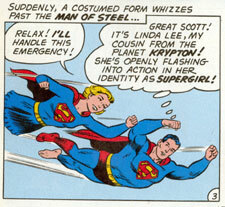 Add to that the combination of Superman's outfit changing from panel to panel, all the while his exasperation level mounts ever higher as he's confronted by ostensible friends acting in outrageously callous manners--Supergirl disobeying his wishes to keep her existence a secret, Krypto the Superdog ignoring his master in lieu of Lois Lane, Lois ignoring Clark (in Bermuda shorts, yet!) 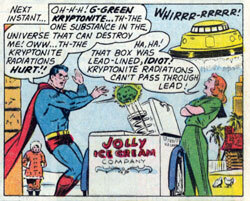 in lieu of lunching with Mr. Mxyzptlk, and most chillingly, Lana Lang--inexplicably showing up dressed as an ice cream vendor--attempting to kill her old beau, only to see him rescued from a Kryptonite induced doom by the crusading trio of--HUH?--Lex Luthor, Bizarro, and Brainiac!?! This was a LOT to take in, folks, especially seeing as how it was expertly drawn by Curt Swan, the artist whose work already seemed synonymous to my neophyte eyes with the caped Kryptonian. Four years means practically nothing now, sure, but when you're 8, it's a pretty hefty chunk of your life before you make it all the way to 12. That's how old I was when, in late 1965, under the guise of his recently instituted "Hall Of Fame Classics" featurette (also known as "Cost Cutting Reprints"), Mort elected to run "The Night Of March 31st" for a second time in the back-up slot of ADVENTURE COMICS #339 (an issue which, incidentally, has its own unsettling legacy, as it contained the very last story long-time penciller John Forte worked on before his untimely passing, made all the more macabre by the fact that this particular "Legion of Super-Heroes" story's final panel featured nothing less than a dead Beast Boy lying in stiff repose!?! For more background on this, check these two strips...). Funny thing is, it ALSO ran in the 1987 hardcover compilation, "The Greatest Superman Stories Ever Told"--wherein credit was given to long-time Fawcett comics stalwart, Otto Binder, as the actual author, if not evil mastermind, of the piece--and besides being printed on appreciably better paper, I was mildly shocked to discover in the course of preparing this that when it had turned up in ADVENTURE COMICS years earlier, it had been truncated by two-thirds of a page, four panels to be exact!! Apparently, Mort only had 7 pages at his disposal, so "Hall of Fame" entry or not, it went under the knife! 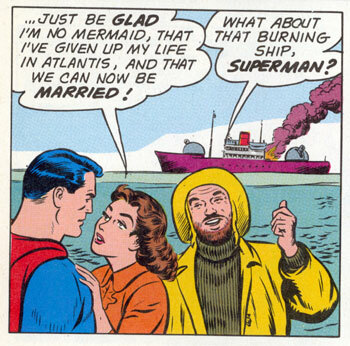 Yup, Superman's college sweetheart, the one girl he actually proposed marriage to, at least before finally realizing that she was a mermaid! (...Do they call it "petting" when fish scales are involved, I wonder?...) Given THAT convenient plot twist, Supes had to make due with Lois and Lana subsequently panting after him relentlessly, to no specific outcome. Ah, but what if good ol' Lori woke up with a pair of legs one fine morning--and, implicitly, ALL the other necessary, um, working parts--instead of that nasty ol' fish-tail of hers? Wouldn't that allow for a resumption of their engagement? The thing that gave this story its unsettling resonance was the Man Of Steel's decidedly paranoid reactions, as he is continuously surprised by what he encounters (Perry White--a Bizarro? And a well-spoken one, at that? 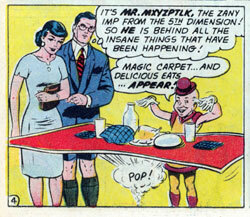 Mr. Mxyzptlk, willingly speaking his name backwards and thus returning to his own dimension? Red Kryptonite proving to be ineffective? Krypto losing his powers, and not Streaky the Super Cat, as is normally the case? Ma Kent--selling SUPERMAN comics at the corner newsstand--letting anyone who antes up a dime in on this little secret identity scam of his?) --WHAT IS GOING ON HERE, our beleaguered hero wonders? 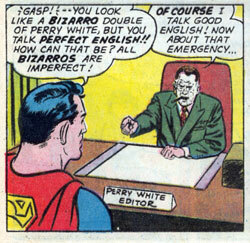 And yet, for all his self-awareness of the topsy-turvey nature of this skewed situation, Supes has absolutely no awareness of such off-kilter oddities as his (otherwise non-existent) telepathic powers, or the ill-advised way he chose to enter Editor White's office (directly through the wall) or exit it (through a window--a CLOSED window!...). 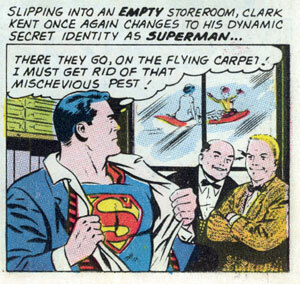 Then there's the two fellows grinning as they watch Clark change into his caped outfit in the alleged privacy of the Daily Planet's supply room (Swan and Kaye being the grinning voyeurs, I believe), and the whole glasses on/glasses off, cape on/cape off stuff. Flying with one dress shoe. Flying barefoot. Jimmy Olsen in a tux one panel, a striped jacket the next. Lois and Supergirl's hair lengths changing radically from one moment to the next. Pay phones on office desks. The Leaning Tower of Pisa snuck into the background of a Metropolis city-scape. Lana standing a foot off the ground for no good reason. Backward S shields. Supes wearing Mr. Mixxy's derby. All of this goes uncommented on by the stories participants, even the seemingly aware star. 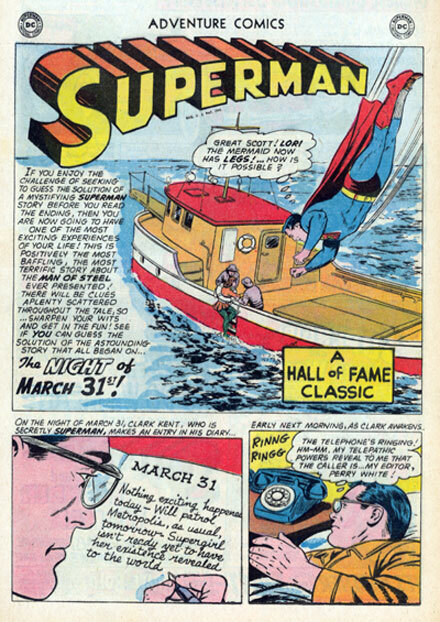 (...Several years later, in SUPERMAN #169 (May 1964), editor Weisinger tried to duplicate this successful venture with a five page story entitled "The Great DC Contest", but just as that anonymous vocalist fronting the Four Seasons also undoubtedly found out, the SECOND time isn't usually quite so memorable. Y'see, the gimmick this time around had the reader scour the episode's every panel (AFTER the introductory splash), looking to spot the sole "D" and the sole "C" used to miserly effect in the story.